My name is Mike (ghetto fireman) username. Getting ready to retire after 31 years with a large So. Cal municipal fire dept. 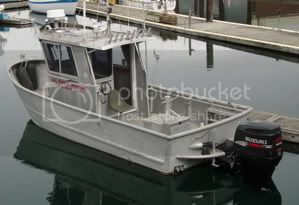 Would like to purchase a clean used 23 ft Pacific Skiff for some local and island fishing. Thanks for you consideration. Last edited by Ghetto fireman on Sat Jan 07, 2017 7:44 pm, edited 1 time in total. Welcome Mike, Those are hard to find because they aren't high production boats. They are built to order for individuals that tend to keep them for a long time. You could be one of those people too! You deserve a new boat after all that hard work and the folks at Pacific Skiffs would love to build one for you. Keep it 10 years and I guarantee if it's still in nice shape you'll sell it for close to what you paid for it if not more. Get the exact model you want and groove on all the factory options to make it yours. Welcome aboard Mike, we will help you look for your boat. By the way my cousin is a retired Anaheim FD Battalion Chief [T. Vandiver]and is here on the site. I have an email into Pacific Skiffs now, I am sure they get a lot of interest in their boats. Why don't I see more down here in Cali? Do you know the approx. turn around time for a new one? Can I tow with 1/2 ton pickup? Yes you can tow with a 1/2 ton, my 23 is about 5800lbs TOTAL, sitting on a 1900lb steel trailer. Why you don't see more is the cost of a new boat and those that buy them seem to hang onto them for ever. Thanks, received the email from Julie, I may just have to pull the plug and buy myself a retirement gift. They are awesome boats, I could go crazy with the options. Wifey says no way on a new model, so keep your eye out for a used or demo for me, PLEASE ! I called about the 23 on Craigslist, sale pending, buyer flying out from Alaska to look at it this weekend. Mike, you can handle a little resistance. Just walk into the living room while she's watching the tube and bury the pickhead into the coffee table then calmly announce that you have just placed an order for a fully decked out 23 hardtop and now you are going out to buy fishing tackle and would she care to join you . . . ? I hear ya!! But the saying is so true in my case "Happy wife-Happy life". I am sure some of you can relate. I know how difficult finding a used custom made boat will be. If I win the lotto and find one , could I tow it back to WA to add accessories? welder wrote: Welcome aboard Mike, we will help you look for your boat. I know quite a few Anaheim Guys, good department. Thought I would bump this to the top and wish everyone Happy New Year. Still looking for 23 Pacific !!! Hard to believe my last post was 1 year ago, still looking for the right boat. If your considering selling, please contact me.